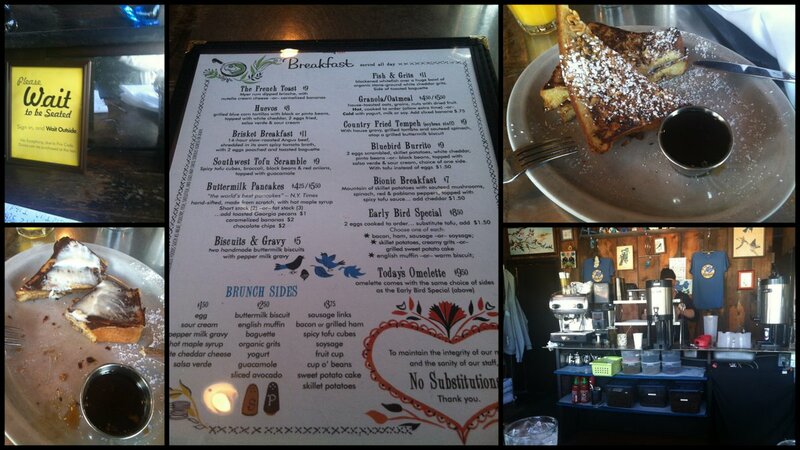 Google “best breakfast in Atlanta” and one of the top results will probably be Ria’s Bluebird. This diner in Atlanta was featured on a Travel network show about breakfast places. This restaurant opens 8am-3pm. They do not accept reservations. When you arrive, you sign in and wait outside until your name is called. The smaller the group the better chance you have of a short wait. When we went, it was hubby and I, so our wait was about 20 minutes. I ordered the special: almond crusted French toast stuffed with cream cheese sweetened with local honey served with warm maple syrup on the side. This was the best French toast I have ever eaten. Everything about this plate equaled perfection. To drink, I ordered fresh squeezed orange juice. You cannot beat fresh squeezed OJ. The décor has a retro vibe to it. The wait staff is friendly but no nonsense. They make some small talk, but keep it moving because they have a lot of tables to serve and a lot of orders to get to hungry people. Hipsters were crowding the parking lot waiting for tables in the packed restaurant. Sometimes a restaurant becomes a trendy place to eat but the food is mediocre at best. In the case of Ria’s Bluebird, the food lives up to the hype. I can see why they were featured on TV and are known for have the best breakfast in ATL. I recommend getting there early and ordering the special (especially if it is almond crusted stuffed French toast). Leave with a happy belly and satisfied smile.